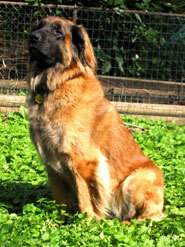 Zenobia was a fantastic example of a female Leonberger. She had a gentle temperament but a very outgoing nature. She believed that the world was her playground, rarely running at less than top speed. Her tail was in constant motion, wagging with joy for reasons as simple as celebrating a new day. Zenobia was a Therapy Dog certified by Therapy Dogs International, had an AKC Canine Good Citizen, was Temperament Tested, and had an illustrious dog show career. Zenobia finished as a Champion in all major venues in the United States and Canada. She was a Champion with the Leonberger Club of America (LCA) the Leonberger parent club, a Champion with the American Rare Breed Association (ARBA), a Rarities American, Canadian, and International Champion, and was a Canadian Kennel Club Champion. Zenobia was a voracious swimmer. She enjoyed her annual vacation at the North Carolina Outer Banks beaches where she swam for hours. When she visited her breeder, Ann Rogers, in Ohio, she HAD TO swim in Ann’s pond. With a stick in her mouth she would paddle for hours and resembled a muskrat in water! Zenobia was that incredible dog for David. We will miss her dearly. To see Zenobia’s pedigree, click here. To learn more about Zenobia’s breeder, click here. To see Zenobia’s medical clearances, click here.